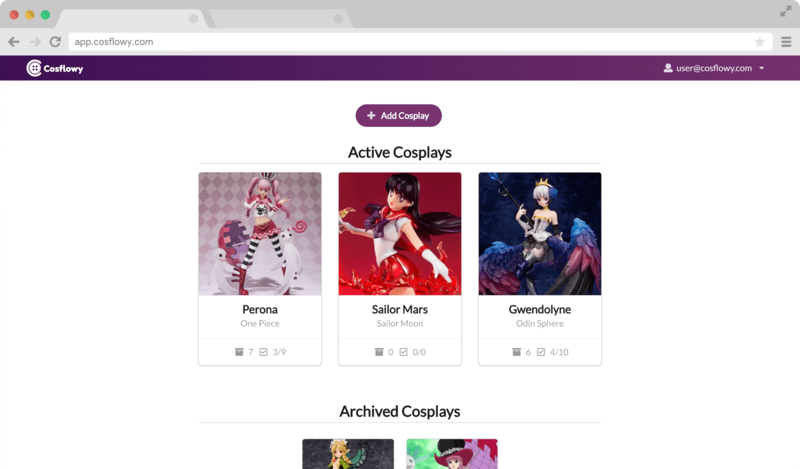 Cosflowy is a modern web & mobile application to help you plan, track & organise your cosplay projects. Cosflowy is the best place for your cosplay projects! Its modern and sleek interface gives you all the tools and features you need to take your hobby to the next level. Plan and organise every single element of your cosplay, whether it's a purchase or something to build from scratch. For every element of your cosplay, you can add specific materials, expenses, and tasks to easily gauge the progress of your costume or props. 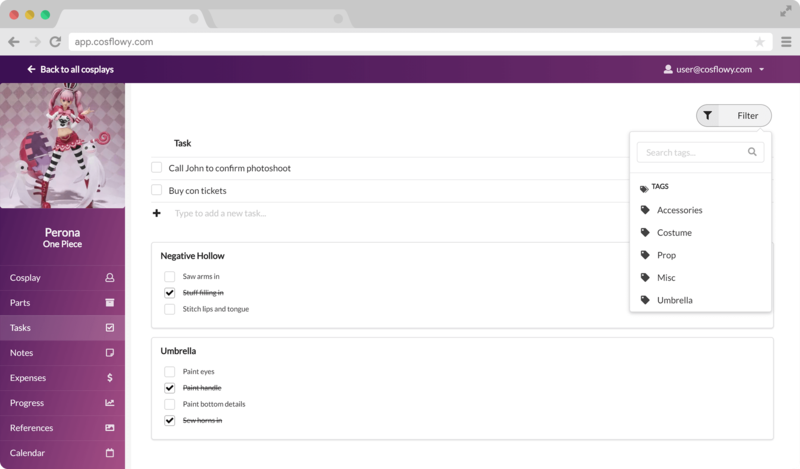 To-do lists and handy colorful notes lets you keep track of your most important tasks. Organize them even further with tags and deadlines! 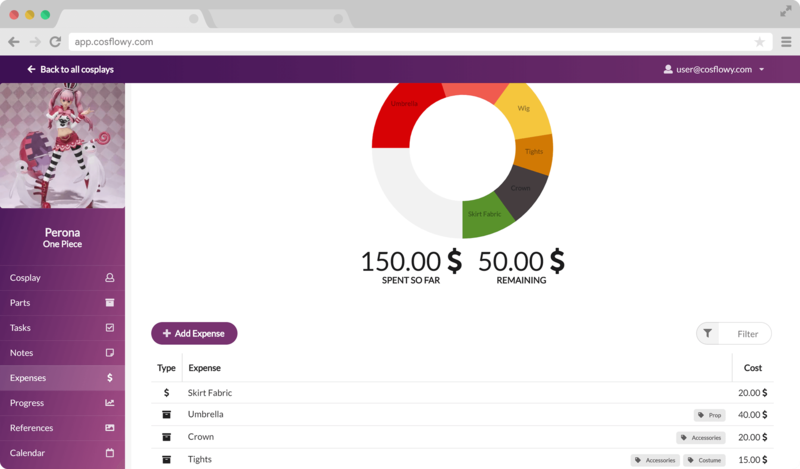 Plan a budget for your cosplay and keep track of every expense and purchase - visualise at a glance how much you're spending. Create your cosplay's story by recording milestones and achievements. 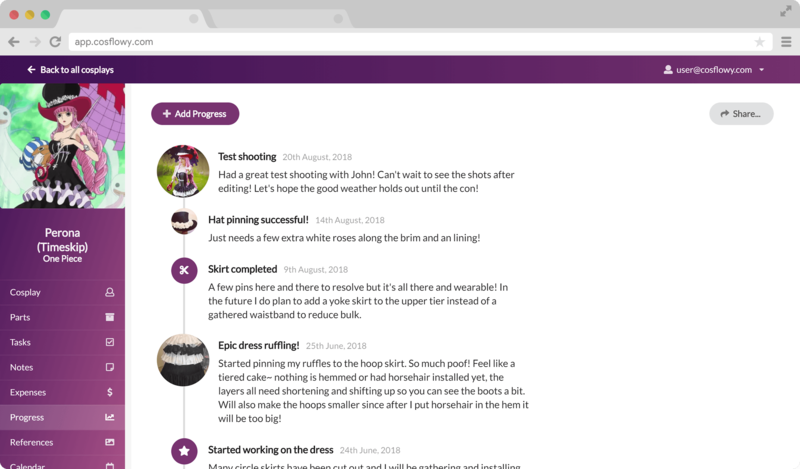 Create and share beautiful progress timelines! Create collections of reference images. Sort and display them in a convenient gallery format to nail down every single detail! 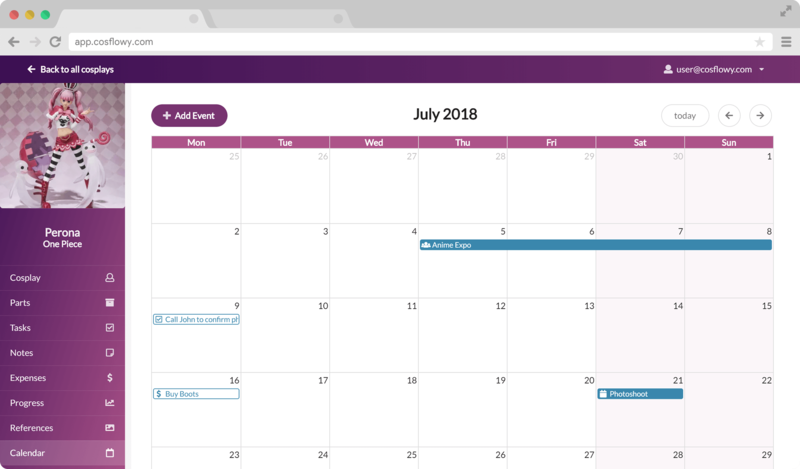 A calendar view lets you schedule events like conventions or photo shoots and see all important deadlines for your cosplay tasks. Cosflowy works best on a desktop browser, but you can try our early release of the Cosflowy mobile app with partial offline support for iOS & Android! 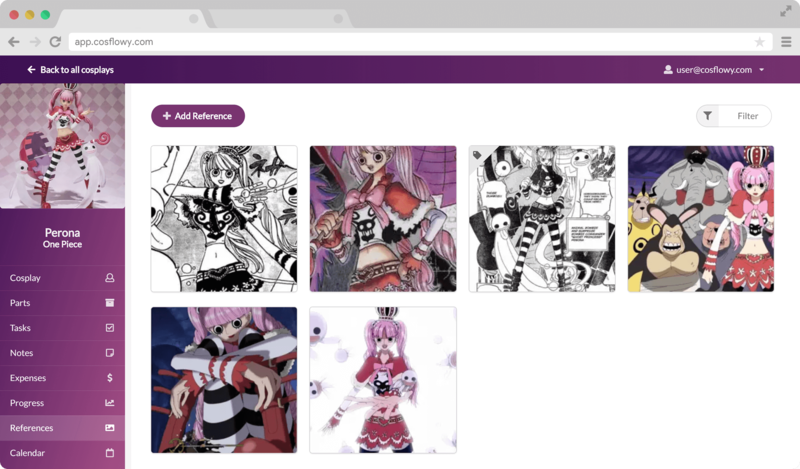 Log into Cosflowy now and start planning your next cosplay masterpiece! 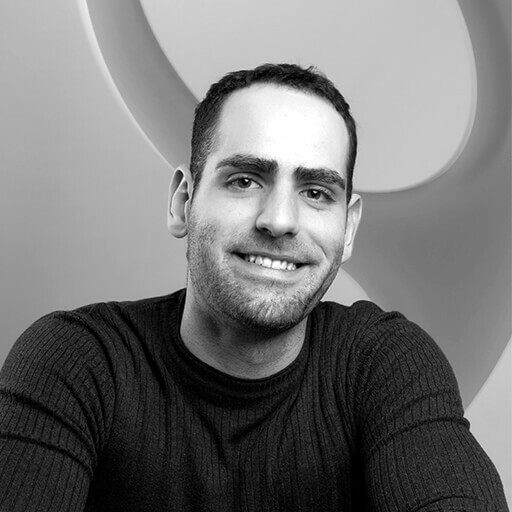 Hey, my name is Leo and I am the developer of Cosflowy. My partner is an avid Cosplayer, and while I love seeing her amazing creations, I hate to see her stressed as the next convention approaches - not the biggest fan of the house becoming messier than a battlefield either! That's why I set myself to build a tool that would help her plan her cosplays a bit more effectively, something so sleek to use that would make future projects exciting and not indimidating: I wanted her to take wasted time away from last-minute changes and put it back into masterful crafting. That tool is Cosflowy, and I hope it will do all this for you as well! Feel free to contact me - I want to know how I can make Cosflowy into a tool you can see yourself using every day. Sorry in advance if you are having a bad experience or something is not working as intended. I am only human and sometimes things escape me. Let me know how Cosflowy can improve or about any bugs - I'll fix them as soon as I can! 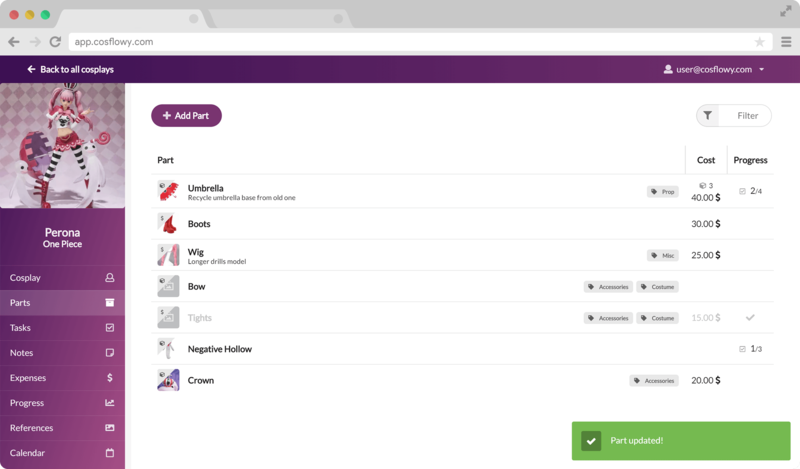 Cosflowy's development is totally transparent - you can see what I'm working on and help me find out what would make Cosflowy useful for you by visiting the development board to suggest or vote on the most important features to implement.